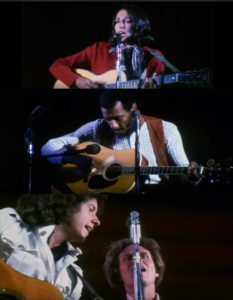 Previously-unreleased, this 1970 benefit concert featured Arlo Guthrie, Joan Baez, Pete Seeger, Country Joe McDonald + more. 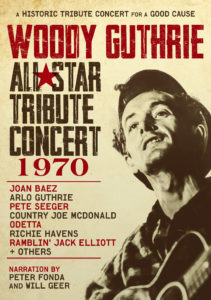 The Woody Guthrie All-Star Tribute Concert from 1970 at the Hollywood Bowl is a rare historic performance that has never been seen before featuring Arlo Guthrie, Joan Baez, Pete Seeger, Country Joe McDonald, Odetta, Richie Havens, Ramblin’ Jack Elliott and others in their prime along with onstage narration by Peter Fonda and Will Geer. Produced by 4-Time Emmy Award Winner Jim Brown, the performances were extensive and the concert most certainly one-of-a-kind. And, as was always the case with folk artists, the music reflected and electrified the social fabric and consciousness of the time. Audio interviews with Arlo Guthrie and Ramblin’ Jack Elliott.